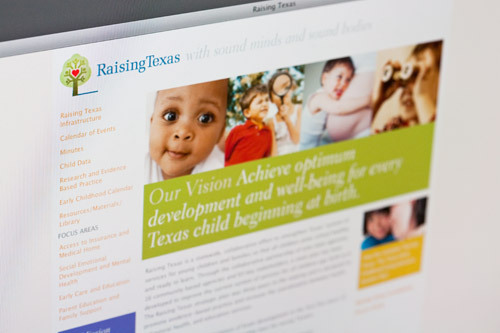 Raising Texas is a statewide, collaborative effort to strengthen Texas‘ system of services for young children and families so that all children enter school healthy and ready to learn. The challenge was presenting a mountain of content in a well organized and structured manner while keeping the acronyms from the myriad of state agencies involved from obfuscating the really important information. Because of a limited budget we utilized the client's pre-existing image library as hero imagery and spot support in various sections to keep things from appearing too staid and dry.